There’s no doubt that ants are fascinating creatures. Not only are they capable of building intricate nests, but they also have a pretty advanced society- they even go so far as to farm other insects like aphids. However, while ants are impressive, they can also be more than a little annoying- especially if you end up with an infestation on your hands. From the early spring right the way through the summer, ants will thrive anywhere that they can, and if you leave them unchecked, they could have a serious impact on your garden. By themselves, the ants we get in the UK aren’t harmful to humans, and they won’t do much more than just crawl wherever they can in search of food. However, gardeners should bear in mind that, as we mentioned above, ants often rely on aphids to produce food for them. They will therefore do all they can to encourage a large, active aphid population, and will even go so far as to help aphids move from plant to plant to feast upon fresh leaves. 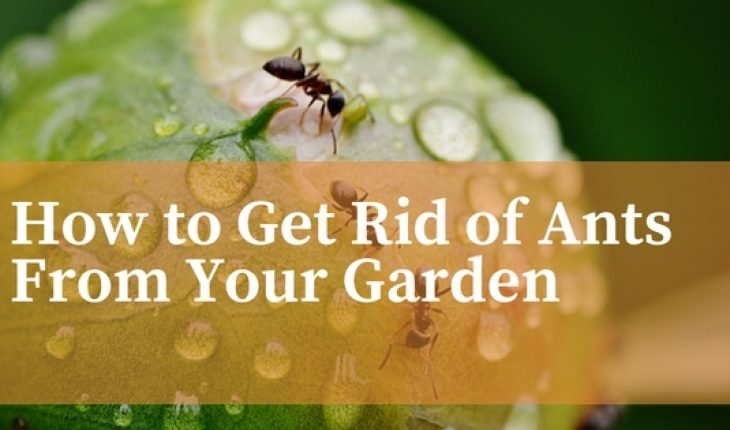 Before you know it, you could find that the ants have spread aphids across your whole garden, leaving all your precious plants nibbled to pieces. Fortunately, if you catch the problem early on, then it’s not too difficult to deal with ants in your garden. There are a number of different ways that you can quickly and easily destroy an ants nest, although it can take a few treatments to fully remove the problem. The most important decision you’ll need to make is whether or not you want to use pesticides. On the one hand, these are the most efficient and effective way of killing an entire ants nest in one fell swoop. On the other hand, the chemicals in these pesticides can also damage, or even kill off entirely, surrounding plant life. While they are a good choice if an ants nest is hidden below your patio, you might want to think again about using them in your vegetable patch, or next to your prize rose bush. Don’t worry, though- there are plenty of other organic methods you can use for getting rid of ants in your garden, and we’re about to talk you through some of them! To have any hope of eliminating an ant infestation, you’ll need to tackle the problem at its source- the nest. Even if you kill every ant you spot on your lawn or patio, there will still be thousands more lurking in the nest ready to replace their fallen comrades. To find an ant nest, keep a close eye out for any little piles of disturbed earth on your lawn, in flowerbeds, or in the cracks between paving stones. If you’re going down the pesticide route, then follow the instructions on the packaging and apply a liberal amount onto the entrance of the nest. This will gradually seep down into the nest itself and kill off the ants inside, so you don’t need to put much effort into this approach. Just reapply the pesticide as necessary, and you should start to see those ants disappear before long. As promised, though, this isn’t the only way of tackling an ant infestation. One method that’s been used for generations is to track down the entrance of the nest, and then pour a kettle full of boiling water into it. This will immediately kill the vast majority of the ants inside the nest, so it’s a very effective way of scaling back the number of ants in your garden immediately. There’s another benefit to this approach, too- the water will flood the tunnels and chambers of the nest and cause them to collapse. Before they can get back to bothering your garden, the remaining ants will have to rebuild their nest from scratch. Be aware, though, that it might take a few rounds of boiling water to completely eradicate the nest- so keep an eye on the area to check for any big congregations of ants in the next few days, and pour more water on the nest as necessary. If you don’t want to bear the full responsibility for removing ants from your garden, then there’s an easy way to get mother nature to give you a helping hand- installing a birdbath or birdfeeder! This will help to attract plenty of birds to your garden, many of which will naturally feed on ants. Some will just pick up any ants they spot on the ground, while others will be much more aggressive, and even peck their way into the nest itself to feast on the ants inside. This approach has the added benefit of bringing more wildlife to your garden, so it’s definitely worth considering for those who like to make their garden feel like a more vibrant place. Finally, if you want to get the ants to leave your garden without taking an aggressive approach, then there is one more solution- encouraging them to move on, and make their nest elsewhere. You can do this by plugging up the entrance to their nest with stones, which the small ants won’t easily be able to move. What’s more, you should also try sprinkling some peppermint oil around the entrance, which acts as a natural repellant to ants. They will quickly decide collectively that it’s time to up sticks and start a new nest in a place where they won’t meet as much resistance. As you can see, then, you have a lot of options available to you if you find your garden gets taken over by ants. While a pest control company is always an option, this should really be your last resort. Instead, try these different methods, and see if you can’t tackle the problem yourself. Just follow our advice, and you too can take back your garden from these problem pests!